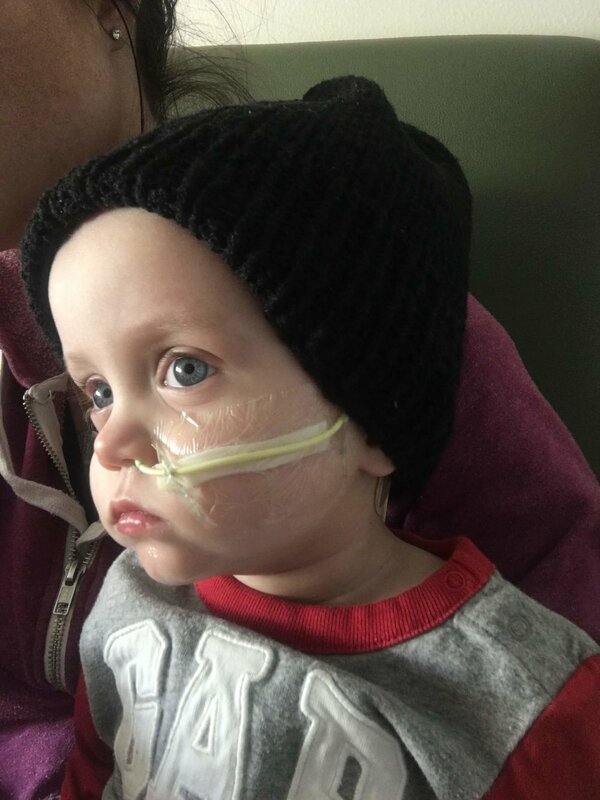 When our 10-month-old son was diagnosed with Choroid Plexus Carcinoma (brain cancer) in January of 2016, our world completely shattered.We had 6 children, 3 of which were 10 month old triplets and one of those triplets was undergoing cancer treatment. Unbearable, extended hospital stays that separated our family made it difficult to maintain any sense of normality! The side effects of chemo and the constant anxiety of possible unexpected hospital admissions meant worry and sleep deprivation for the entire family. And through it all there was an underlying and unspoken worry that we might lose our son, our baby. To say this was a hard time in our lives is an understatement. But what got us through was the incredible outpouring of support and love from our friends and family. It helped ease the painful blow that was our journey through childhood cancer. Set up a meal train. I was in the hospital for 3 weeks at a time and I had to leave my 5 children at home. I had someone set up a mealtrain (https://www.mealtrain.com) and this saved us. Knowing that my kids had a warm meal every night was such a huge relief to me. The great thing about this website is that it is all done electronically and sends reminders through emails. It was a lifesaver! Give gift cards. It may seem unthoughtful and the “easy route” when it comes to gift giving, but having a child with cancer can be a major financial strain on families. Whether it is expenses for parking, co-pays, take-out food, gas, or a parent having to cut back on work hours, the financial stress can be one of the hardest parts of the childhood cancer battle. Gift cards for grocery stores, pharmacies, gas stations or restaurants can be a major help. Along the same financial lines, a family going through the cancer journey has a very hard time accepting help. Set up a financial support fund (www.gofundme.com) to help with all of the added expenses. People want to help and sometimes this is the best way you can help. When a child is diagnosed with cancer, the entire family is diagnosed with cancer. Sometimes the siblings of cancer child can feel jealousy, worry, anger and many other emotions. Send a gift or even a note of encouragement to these kids. They are warriors also, but they are behind the scenes. Give a hospital survival bag. Parents and children alike get so bored in the hospital. Some of the best gifts given to us were things like a tablet for our baby, a netflix and hulu gift card, amazon gift cards to buy books, an ITunes gift card to buy movies, extra charging cords, socks, slippers, toiletry items, a warm blanket, a pillow, and a laundry bag with detergent. These make those last minute trips to the hospital a little more bearable. Remember them a few months down the line. The amount of support at the beginning is huge. But, remember that cancer treatment is a long road. Sometimes months or even years long. After all the help has dispersed, remember to reach out. Offer to help with their other children. I had 5 other children at home while I was at the hospital for 140+ days. I had a neighbor that made a sack lunch for my two oldest kids every day for school. I had other neighbors that got my kids to school every day and another neighbor that made sure my daughters hair was done every morning. These may seem like small things but they are extremely helpful to help children feel "normalcy" during a very difficult time in their lives! Offer to put up holiday decorations. My baby was sick around Christmas time and I had neighbors put up our Christmas tree and Christmas lights on our house. My children loved to have a reason to celebrate still. And it goes along with providing normalcy. Help with yard or house work. One of the things that absolutely gets lost in the shuffle of fighting pediatric cancer is the basic upkeep of a house. Any extra time should be spent with each other since that is a rarity and provides so much. Offer to pay for house cleaning. As neighbors, take turns shoveling their walks and mowing heir lawns. This is more helpful than you realize. These recommendations are all based on our personal experience. The journey can be different for different diagnosis’. Most important thing you can do is let people know you are there. Show up. Be a part of the good. We all can make a difference.